Of all the sounds to wake up to in the morning, the sea must be one of the most lovely – while down in Cornwall for the weekend, the novelty of this didn’t fade. Our first port of call, The Scarlet Hotel in Mawgan Porth, is right on the water’s edge, and is that rare thing – a hotel where you feel truly comfortable. We were never hurried, yet never made to wait. We felt welcomed and at ease throughout, which was largely due to the fantastic staff. I am not often prone to effusion, but will have to make an effort to resist. I never saw any of them frown. Not when we borrowed their sun cream, asked if we could delay our table for supper so we could have a drink, or pottered about the hotel early in the morning while they were trying to clean, investigating hidden gardens and alcoves. Nothing was too much trouble, and nothing stopped them from smiling. The hotel’s whippet, Jasper, was a particular highlight. There is a small sign in reception, with a photo of him looking particularly enthusiastic, offering his services as ‘available for walks on request’. Guests own dogs are welcomed, but in their absence, he’s a great substitute. Yoga on the beach before breakfast was also thoroughly relaxing, after which we felt justified in making the most of eggs and toast on the balcony, looking out to sea in the morning sunshine. Sculptures throughout the hotel are genuinely interesting, and totally in keeping with the coastal surroundings. These themselves are gorgeous. We were very lucky with the weather, but I imagine that the cliffs and beaches, of which there are many, would be no less stunning in the wind and the rain. 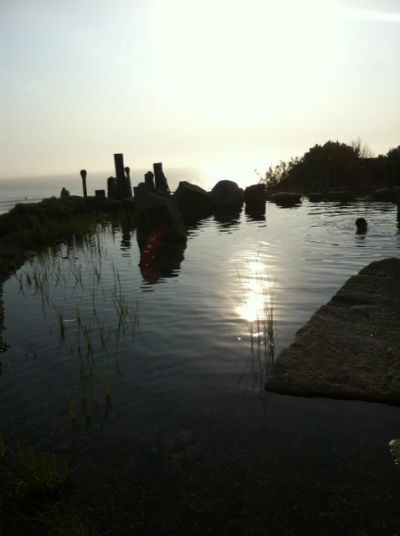 And when the weather does overwhelm you, there’s a spa, library and freshwater pool, surrounded by rocks and reeds. 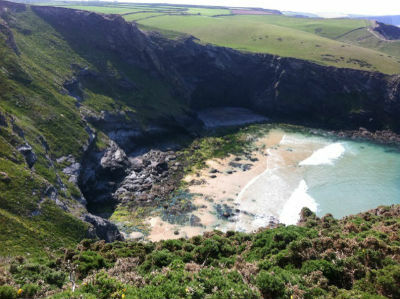 Local highlights include the cliff walks in both directions, either towards Newquay, or the Bedruthan Steps. A very steep set of steps leads you down to these, and they are beautiful, as well as very foreboding, being so colossal as you walk on the sand between them. We also visited the impressive Eden Project and The Lost Gardens of Heligan, which are breathtaking, with a huge range of plant life on show. The Herring restaurant, which is very good, is a short walk from the hotel, although the Scarlet’s own food is certainly not to be scoffed at. Both offer a huge range of fresh fish, which is, needless to say, delicious. 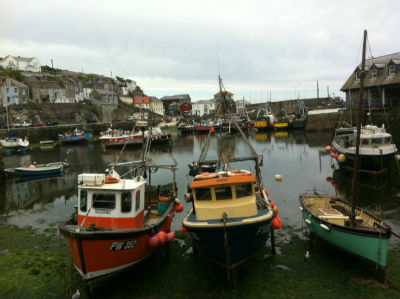 After Heligan we headed to Mevagissey, a small fishing village on the south coast, where I saw something that I haven’t stopped talking about since – a hermit crab up-scaling to a larger shell. For those who live by the sea this is probably not very exciting, but I was fascinated by the thorough investigation of the new abode, followed by the prolonged process of wriggling from one to the other. I needed a local delicacy to recover from the excitement, (namely a cream tea), on offer everywhere of course, and surely a compulsory rite of passage when visiting the county. 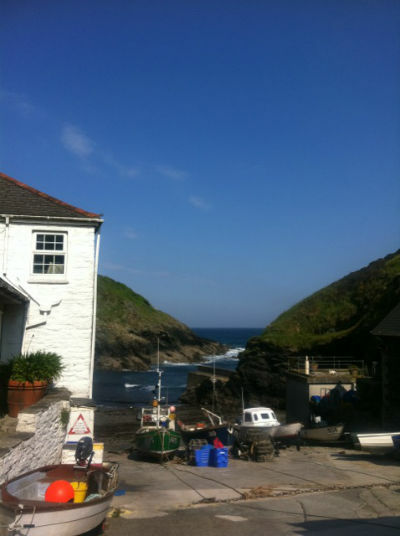 Our second hostelry was The Lugger in Portloe, the smallest and prettiest of places, with just one single-track street, perched right on the water’s edge. Here I was not woken by the sound of the sea, perhaps because I was growing used to the luxury of having it there, but by the fishermen heading out with their lobster pots, right underneath my window. This is where to come if you want to forget that the world exists. And had it not been for the newspaper delivered to my room, I might have done exactly that. The food is great, and the welcome warm. We played board games by the fire in the evenings, on sofas big enough to really curl up in, and walked along the wind-swept cliff tops by day, to admire the view around every bend. The hotel has a very family-run feel to it, and is close to so many fantastic gardens, beaches and villages, that you’re never short of something to do.